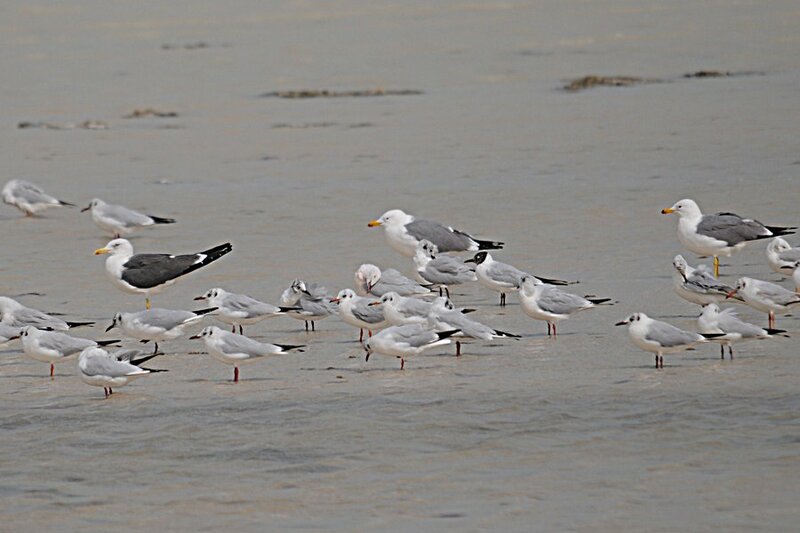 Over the last few days I have been seeing a number of Large White-headed Gull (LWHG) at various locations in the Eastern Province of Saudi Arabia. Many of these birds spend the winter in the Eastern Province, but many more pass through on passage with the peak return passage being between February and April. Shown here are a few photographs taken at various locations on February 17th 2012. 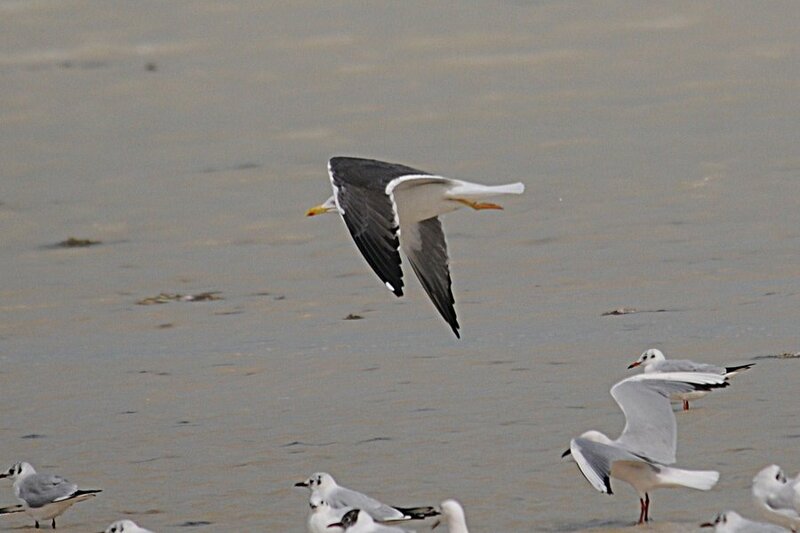 The first bird is an adult Steppe Gull photographed at Sabkhat Al Fasl (Jubail) where gulls like to stand on this lone island in the middle of a small lake. All three photographs are of the same bird. 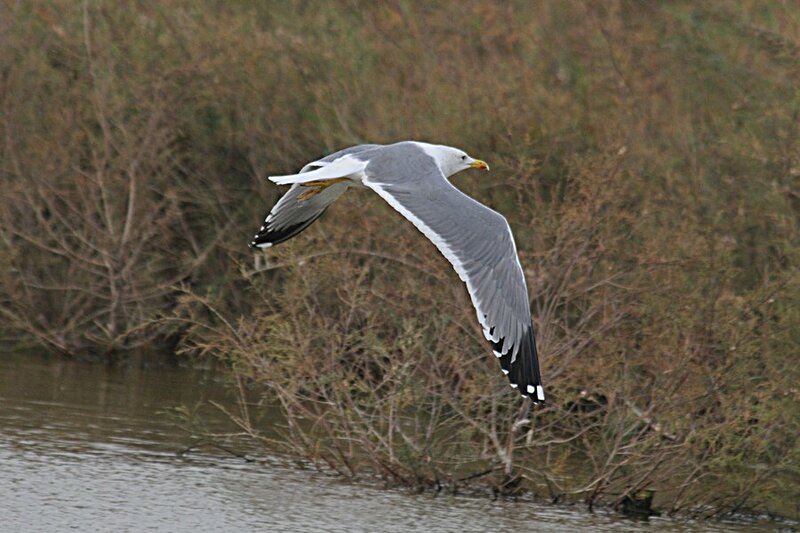 This is the commonest of the large gulls seen in Saudi Arabia with approximately 75 – 85% of all LWHG being this species. The remaining photographs were taken at the Dammam – Al Khobar Wader Roost South, where a large group of LWHG were present. Unfortunately I was unable to photograph the birds on the ground as they were all flushed by a passing truck before I could get near to them. Fortunately though a few LWHG were sitting on the one remaining island as the tide was coming in and I could get reasonable views through the telescope. 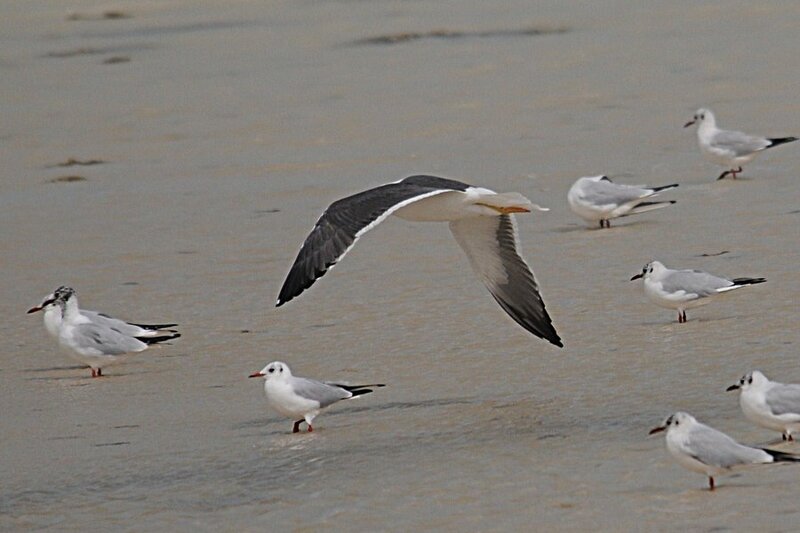 It became clear that although there were six Steppe Gulls there were also a couple of different types. One was a very dark adult Heuglin's Gull (Larus fuscus heuglini), showing its long primary projection, fierce look, long bill and typical upper & under-wing pattern. This is an uncommon winter visitor to the Eastern Province of Saudi Arabia with approximately 8% of all birds seen being this species. 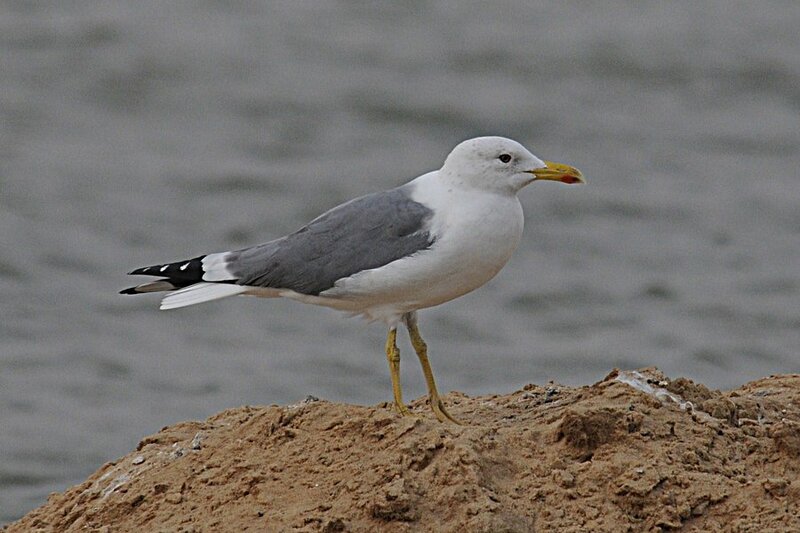 There has been much confusion in the past on the identification of Armenian Gull in the region with the simplistic idea that any gull with a four tone bill and complete black bill band was an Armenian Gull being used. This was due to the lack of knowledge about the species and it is now clear that Steppe Gull can show these features in winter. As a result the status of Armenian Gull in Saudi Arabia and Bahrain is not clear. Some very good birders who have been present in the region for some time have failed to identify the species so it is probably a rare winter visitor at best. They look like the bird in angry bird game. The white which drops an egg when it is in the air but the big difference is the ones in this picture has small beaks. 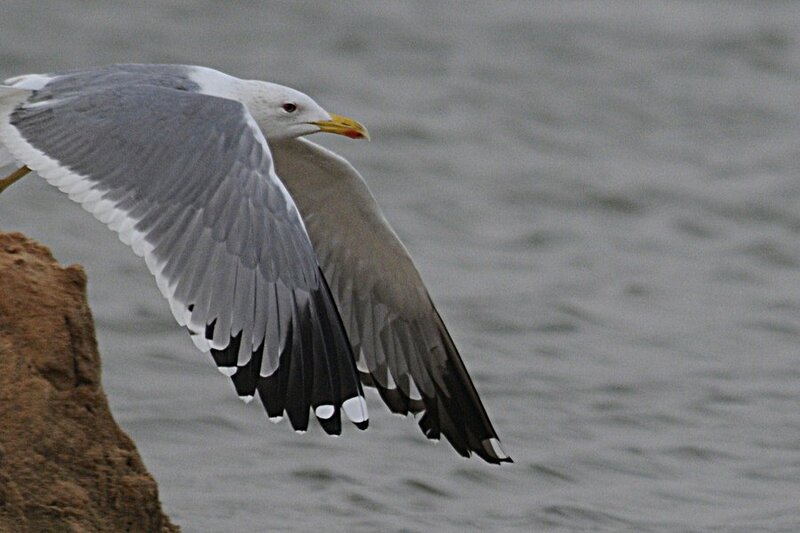 Your pics of Baltic Gull, posted today, are interesting. I see graellsii and intermedius alot and when I see your fuscus photos I can hardly believe how different the whole stance profile is compared to the other two. The high. pointed wings giving such a curved effect - very distinctive. Also the long, parallel bill. However, what really strikes me is how pale the upperparts are, perhaps not as pale as graellsii but paler than alot of intermedius. The literature particularly states that there is no contrast between upperpart colour and primary colour. Photos in Malling Olsen and Larsson show no contrast. I have not seen fuscus, other than a few possibles in England - which had no contrast. And you even mention that you find this bird - very dark! The stance shown in Malling Olsen is also different to your birds, completely lacking that high, curved primary appearance. So how much darker exactly is your average fuscus compared to graellsii? Having read what you have written regarding Gull ID on your blog I am aware that you are an expert, so Jem - something doesn't seem quite right here to me - what do you think? Thanks for the message, it is always nice to receive ideas and thoughts from other people, as it is quite a lonely experience birding out here. I would definitely not regard myself as an expert in identifying the gulls out here, although I do have many years’ experience looking at gulls in the UK where I spent many years in Plymouth as a student and afterwards. I have only been out in Saudi Arabia for one winter and although I have spent quite a bit of time looking at the gulls I have not really found an ideal place to view them. All the rubbish tips are private and no access has been granted and views on the coast are often distant. The colour of the mantle was very dark in the field and much darker than the nearby Steppe and Armenian Gulls, as can be seen from the photograph of the birds all standing together. The bird was also darker than any Heuglin’s Gull I have seen out here and the structure and shape of the bird does not fit my idea of a Heuglin’s Gull. Armenian Gull has a mantle colour approaching graellsii and as you can see the mantle of the Baltic Gull is very much darker than this. The very bright light in Saudi Arabia and the fact these birds have probably been in the intense sun for some months makes the plumage less ‘Jet back’ than would be expected in northern Europe I suspect? 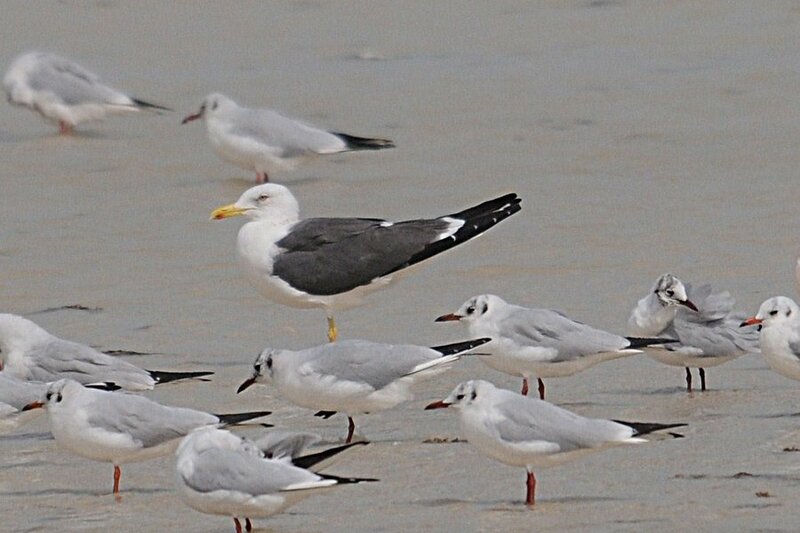 I have never seen fuscus and graellsii together, we do not get graellsii in the Middle East and I never saw a fuscus in the UK, so do not know the answer to the question, “So how much darker exactly is your average fuscus compared to graellsii?” but if you take Armenian Gull as the pale end of graellsii then you can see how much darker Baltic Gull (fuscus) looks from the photograph of them all together, so I would assume that fuscus would look considerably darker than graellsii which is what is stated in the literature. With regards to the statement in Malling Olsen saying there is no contrast between the upper-part colour and primary colour, this is true for the majority of birds seen in Europe but in the Middle East in winter things may change due to the intense sunlight and some bleaching of the feathers? There is an excellent paper by Gibbins, C.N. 2004. Is it possible to identify Baltic and Heuglin’s Gulls? Birding Scotland 7(4): 153-186. This paper shows photographs as well as detailed accounts on the identification of both fuscus and heuglini with photographs 163 showing a presumed fuscus looking like the bird I saw and 165 a heuglini showing the different look (head shape, bill shape etc). The stance may look slightly odd but the stance can change depending on conditions. These birds all flew just after this photograph was taken so this pose may be due to the birds being disturbed by something. 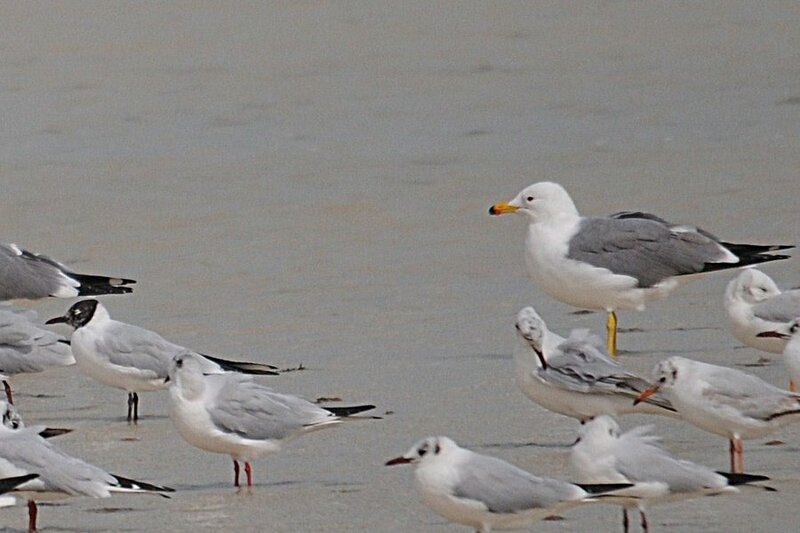 One last point is that as I had not seen Armenian Gull before and only one Baltic Gull, so I sent this photograph to AbdulRahmen Al-Sirhan in Kuwait. He has many years’ experience in birding there and agreed with my identifications of all three species. My references to graellsii and intermedius are simply in relation to upperpart colouration. Your 'fuscus' is certainly not either of these two. However, I have to disagree that light or summer sun bleach etc is the cause of such pale upperparts, the black remiges are, after all, still very black. Of course, I don't have access to your RAW images, but do you really believe the upperparts are so pale because of this? I think that you may have stumbled upon, either an unrecognised 'form' or a hybrid but given that intermedius is closest, geographically, to fuscus the hybridisation would have to be from the next 'form' to the east, heuglinii I believe. I am totally unfamiliar with heuglinii and, essentially, with fuscus but I reckon that your gull has a few heuglinii genes at least. I cannot accept that it is purely fuscus - do think about it again and perhaps elicit some views from some of the experts. I have ringed most of the palearctic shrikes and Lanius schach was always the most accomplished finger nipper!! I followed your advice and looked into this bird again as well as contacted a few dedicated gull watchers. There was a consensus of opinion that the bird is a heuglini for the reasons you pointed out, particularly the mantle colour in relation to the wing-tips. I would like to thank you for helping to correct my mistaken identification and for your comments.